Stable and slightly rising oil prices coupled with a payout to trust holders helped give BP Prudhoe Bay Royalty Trust's shares a decent gain last month. 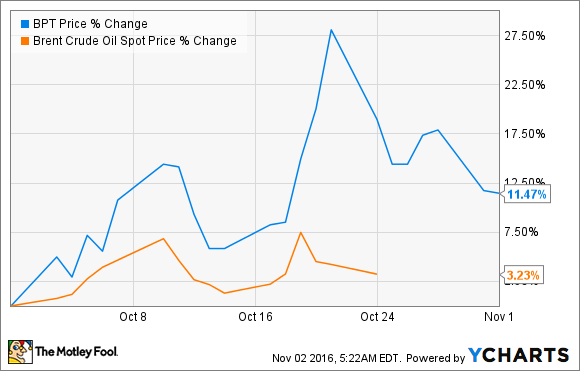 Shares of BP Prudhoe Bay Royalty Trust (NYSE:BPT) gained 11.5% in October. There wasn't much news related to the trust in the quarter, and there was a small bump in oil prices, but the payment of the trust's dividend likely played a role in this. Here's the thing with BP Prudhoe Bay Royalty Trust: It isn't a traditional producer that can make capital allocation decisions. This is basically a direct investment in BP's (NYSE:BP) Prudhoe Bay field. As owners of an interest in the field, trust owners receive a cash payment from the revenue of a barrel minus production costs to BP, and taxes. The average per-barrel costs for production and taxes today is in the $32-$33 per-barrel range, so anything above that is pretty much pure gains for Trust owners. With West Texas Intermediate prices rising slightly in October to the $50-per-barrel range -- the trust uses West Texas Intermediate as the index price for its accounting -- it has ensured that the trust will pay a higher dividend next quarter. This doesn't really explain all of the trust's price gain last month, though, because its share price outpaced the change in oil price by a pretty wide margin. While I'm totally speculating here, my guess is that part of that price surge had to do with the company's dividend that was paid on October 20th, with an ex-dividend date of October 12th. It's not too far of a stretch to see investors hanging onto shares until the dividend was paid rather than selling beforehand, and that gave the trust a bump. Shares of BP Prudhoe Bay have had a rough go of it over the past several years. The rapid decline in oil prices has significantly lowered payouts to shareholders, and pretty much the only reason to buy this stock is to generate income while playing the rise in oil prices. Now that it appears we have reached some sort of bottom in oil prices -- maybe not the absolute bottom, but close -- it wouldn't be a stretch to see shares continue to rise, and increase investors' payouts in the process.